Nivea has partnered with Cancer Research UK to launch a new ad campaign aimed at raising awareness of the best ways to take care in the sun – shade, clothing and sunscreen. 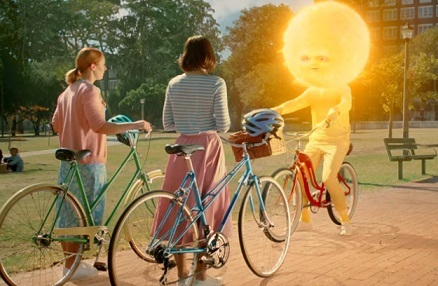 One of the spots included in the campaign, introducing Mr. Sun’s character, features two friends walking down through the park after riding their bikes. When one of them takes out a Nivea product to put on sunscreen, her friend tells her the sun can’t come through clouds. A few seconds later, Mr. Sun shows up near them, on a bike, proving that the Sun can definitely still get through the clouds. The commercial, scored by “Sunshine And You” by R&B/Soul musical group The Futures, from their 1978 album “Past, Present And The Futures,” ends with the voiceover urging viewers to seek shade, cover up and apply sunscreen. NIVEA SUN Safety products line-up includes Protect & Moisture Sun Spray SPF30 and SPF50+, Kids Protect & Care Sun Lotion SPF50+, and more. NIVEA SUN and Cancer Research UK have worked in partnership since 2012 to make the UK public more sun safe. They have communicated the importance of effective sunscreen use, shade and clothing for sun protection through various ads and encouraged families to protect themselves in the sun, whether at home or abroad.